If the 2017 season marked the sudden, vague decline of Novak Djokovic, the early 2018 season was him bottoming out. He showed up in Monte Carlo this week with a 3-3 record, having not won a match since January. In March, he lost two straight matches. He hadn’t even lost two—let alone three—matches in a row since the 2012 Olympics, per Tennis Abstract. This kind of micro-slump doesn’t come around often for one of the most dominant players of his (or any) era. Djokovic took the back half of 2017 to recover from a right elbow injury and didn’t pick up a tennis racket for four-and-a-half months, but he still seemed to be playing through pain when he returned to play the Australian Open this January, weathering a match in Hell and eventually losing a quick one to Hyeon Chung in the fourth round. Something wasn’t physically right. He underwent what he called a “small medical intervention” on that right elbow, and took over a month off the tour to recover. Djokovic would again lose his first match at his next tournament in Miami, this time against the dapper head case Benoit Paire. “I know that you can’t be the person that you were yesterday, and the player (you once were),” Djokovic said afterward, continuing a trend of almost wistful post-match interviews. Again: It’d been six years since he’d felt the sensation of losing two straight, and even those were to Andy Murray and Juan Martin del Potro, not to scrubs. After these losses, Djokovic dumped his official coach Radek Stepanek, as well as Andre Agassi, with whom he’d had a more informal arrangement. Recently Djokovic has been eager to change the scenery when he’s playing poorly. 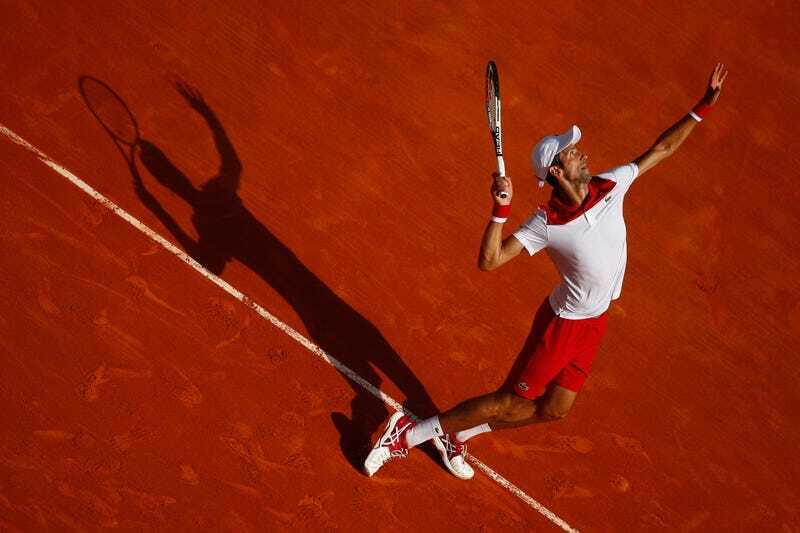 It was exactly one year ago at this event, the Monte Carlo Masters, that Djokovic nuked his longtime coaching staff in what he called “shock therapy.” He reunited with his old coach Marian Vajda right before this year’s tournament, though as of now it’s more flirtation than contractual commitment. Maybe the familiar is doing him some good. Djokovic routed his first opponent and is now in the third round, after today’s 7-6 (2), 7-5 victory over Borna Coric. Djokovic has been starved for a routine win against a lesser opponent, or a well-fought win against a solid opponent. Coric definitely falls into the latter category. For all the young players who’d relish a comparison to Djokovic, he’s closest, in terms of gameplay and physique, if not yet results. (Novak himself has noticed the similarity.) The 21-year-old’s game is similarly built around ravenous court coverage and clean groundstrokes, particularly on the backhand side; it feels like he and his prototype could whack balls crosscourt for six hours without making an error, the ball making the same sound off each man’s racket. When these moves are working for Coric—as they were throughout his surging American hardcourt season, which peaked as he nearly ousted Roger Federer from the Indian Wells semifinal—he’s an exhausting foe. He is happy to play tennis as long as his opponent is willing or able—then just a little bit longer. Unfortunately for Coric, Djokovic is finally feeling comfortable enough to actually play his game and ease into aggression where necessary, instead of treating matches as long and unpleasant practice rallies. He needed 10 match points, but Djokovic finally won, earning himself a much more difficult third-round test. Next up is Dominic Thiem, who is finally back on the only surface where he’s useful, and who obliterated Djokovic in their last meeting on clay.